Course was in really good condition. I expected it to be wet but there was really only 1 hole that was soggy and it was near the water anyhow. Greens were in great shape and rolling nice. Practice Area: Driving range with grass tees, putting green, chipping area with practice bunker. 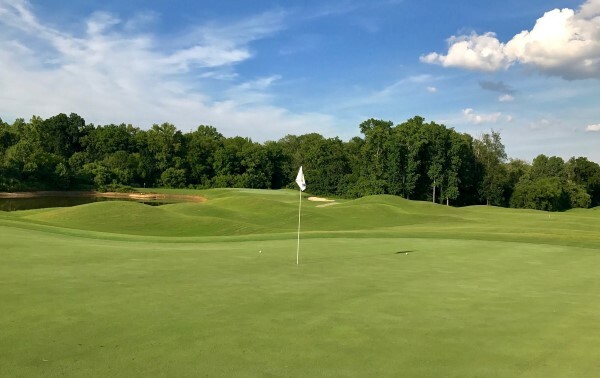 Description: This course is right around the corner from Highland Creek near Huntersville and used to be part of the Carolina Trail. It is now managed by Troon Golf (April 2014) and is back in good shape. It plays like a mountain course with large elevation changes tee to green, making it one of the more challenging courses around town. B-Man's Take: This course used to be one of my top 3 favorite courses around town. I did not play it for many years because came under the mis-management of the Carolina Trail. Now that it has been taken over by Troon Golf, I've come back and love it once again. This is a tough course you'll have to play a few times to get the hang of. With its elevated tees and greens, blind shots and sometimes narrow fairways, it will get you the first time or two. I really like the closing stretch of holes, 15-18. Sixteen is a 178yd par 3 over water. I nearly aced it one round. Seventeen is a long 429yd slight dogleg-left with the same lake running all along its left side. Eighteen has not been good to me so I rank this 553yd par 5 among the hell holes here. The tee shot must stay left of the Skybrook logo oak tree guarding the right side. Then you have to hit a narrow second fairway with swing #2 on this S-shaped hole. Top it off with a bunkered, elevated green and this is very tough par. Skybrook can be expensive, so look for deals. Golfholes.com - Offers 18-hole photo tour for this course.